A poster in the german C/C++ forum asked if there is an index available while using a for each loop. He accidently saw in the debug-window a variable called “$I”. 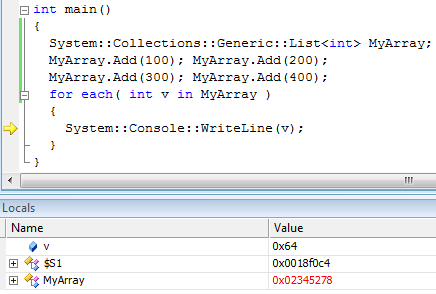 And indeed: There is a “hidden” variable “$I” which can be used inside the for each loop. This variable is the number of the loop-iteration. 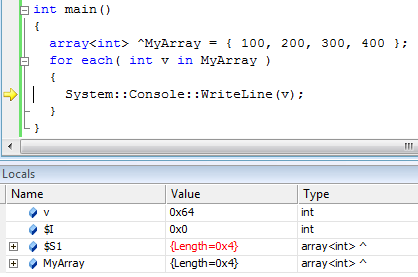 As you can see, it uses a variable “$I” which was never decalred! You can see two “hidden” variables “$I” and “$S1”. And if you step through the loop, you will see that the “$I” variable is incremented for each iteration. “$S1” is a reference to the array. If you dig further into this issue, you will find out, that for each and the normal “for” loop will result in the identical IL code! This is also true for C#! To foreach or not to foreach that is the question. As we can see, the “$I” variable is just a side-effect of the for each loop. It is a compiler generated variable which is used to transform the “for each” into a normal for-loop! Of course, this is only true in special cases like arrays. Do not rely on the compiler generated variable “$I”, and do not use “for each” if you need a index-variable, just use a normal for loop. This entry was posted in .NET, WinAPI on 2009/12/30 by jkalmbach.